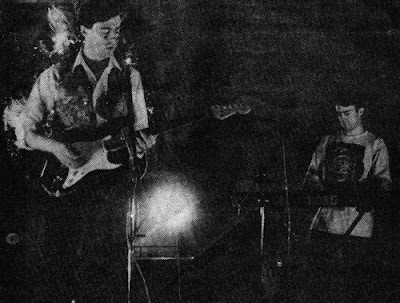 During the early years of Dayglo Fishermen (1990 to 1994), when the band was based in Hexham in the far north of England, the band received regular interest from the local press. This is not surprising, as the band's unique and distinctive sound was far removed from the usual school rock bands that were commonplace in the town at that time. The band's first two albums, 'Drenched' and 'Strange Plaice', featured some highly original dance tracks, and offered a quirkiness level that was off the scale, or at least it would have been if there was a scale of quirkiness to measure it by. It was a sound that had never before been created in the town, and it is unlikely to be again. It was a special time. 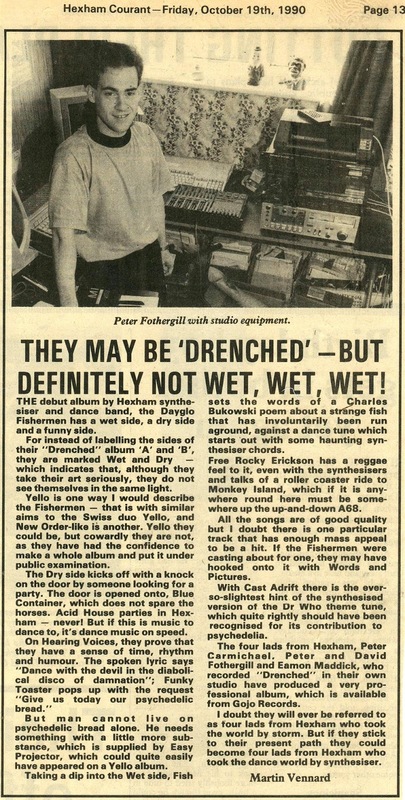 The Hexham Courant's first article about Dayglo Fishermen, published in October 1990. The paper went on to publish two more album reviews. The band's 'What The Hell' album was described as being 'as uptight as one of Bryan Ferry's loose silk shirts'. Later the band's eponymous 1993 album 'The Dayglo Fishermen' was described as 'an engineered piece of chilling, synthetic sound with a distance and apparent sophistication that rock could never manage'. Dayglo Fishermen live at the Moot Hall, Hexham in December 1993. Published in The Hexham Courant. This was to be Dayglo Fishermen's last appearance in Hexham's local paper, for the following year the band uprooted itself and headed south, departing the town for the last time in search of new inspiration. The ten albums that followed are unquestionable proof that they found it. Dayglo Fishermen were featured many more times in other local publications, such as The Evening Chronicle and The Crack, but it's The Hexham Courant articles that matter the most to the band. The support of such local media is hugely important during the early stages of any new enterprise, and should never be underestimated.